Although I cook regularly and try to eat healthy, I completely fall off the wagon in the Summer months. I’m out and about more and generally don’t have much time for cooking. Actually, let me scratch that and be honest. I don’t want to cook. I want to go out to eat at new restaurants and festivals. Have picnics and barbecues. And when I happen to be home I like to order take out. I mean isn’t that what Summer is all about? Nope, it’s not. It’s okay to do all of these things in moderation. But you really should cook most of your meals at home. You’ll choose healthier options, and you’ll know exactly what you put in your food. I’m doing my best to get back on routine for Fall. So I’ve been whipping up some of my favorite take out dishes at home to fulfill my cravings when I get the urge to order takeout. 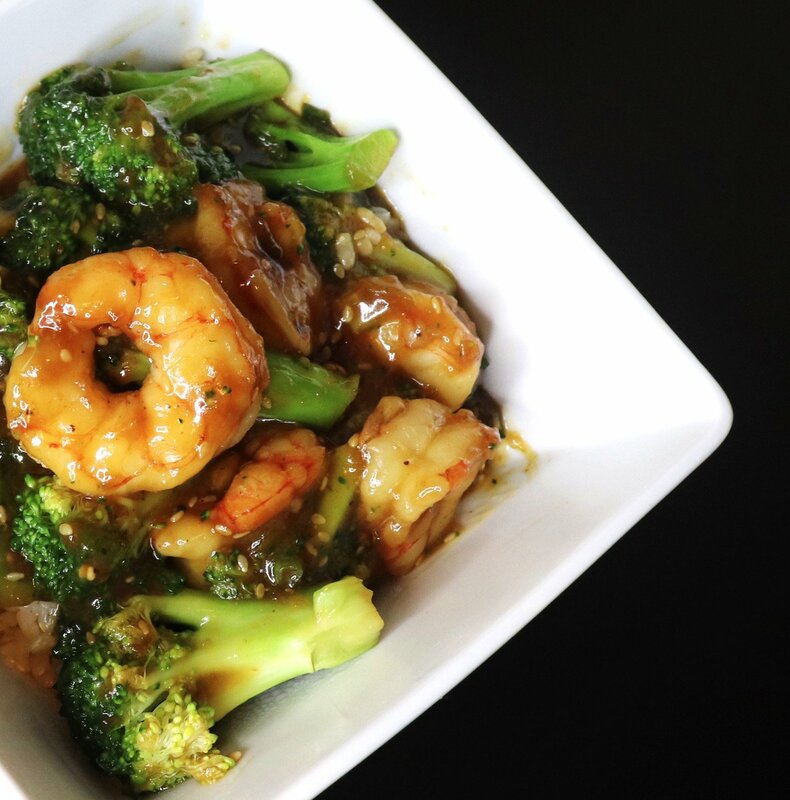 In comes this quick and easy Shrimp and Broccoli Stir Fry recipe. Trust me, you won’t miss your usual takeout. Before I tell you guys how to put this dish together I must tell you all about my favorite shrimp. I absolutely love Trader Joe’s Wild Argentinian Red Shrimp and use them in all of my shrimp dishes. They’re so plump and juicy, and tastes like a cross between lobster and shrimp. And they’re super inexpensive at $9.99 a bag. Moving on, I defrosted the shrimp and seasoned with a tiny bit of Slap Ya Mama seasoning (another fave) and the ground ginger. You can use whatever seasoning you like, or skip it altogether if watching your sodium. You’ll get flavor from the sauce. To prepare the sauce, mix your brown sauce ( I use Trader Joe’s Soyaki), Sriracha, a drizzle of toasted sesame oil and the sliced scallion in a small bowl. Mix your cornstarch with cold water in a separate small bowl. Set both aside. Now it’s time to start preparing the stir fry. Heat a drizzle of sesame oil in a wok pan and add the onions and broccoli. Stir fry for 2-3 minutes then add the shrimp. Stir fry for another 2-3 minutes until shrimp are almost done, then add the sauce mixture. Coat everything evenly and let the sauce start to simmer, then add the cornstarch mixture and stir thoroughly. If your sauce is too thick, gradually add a little water until you get the consistency you want. Let the sauce simmer for 2 more minutes and turn off the heat. 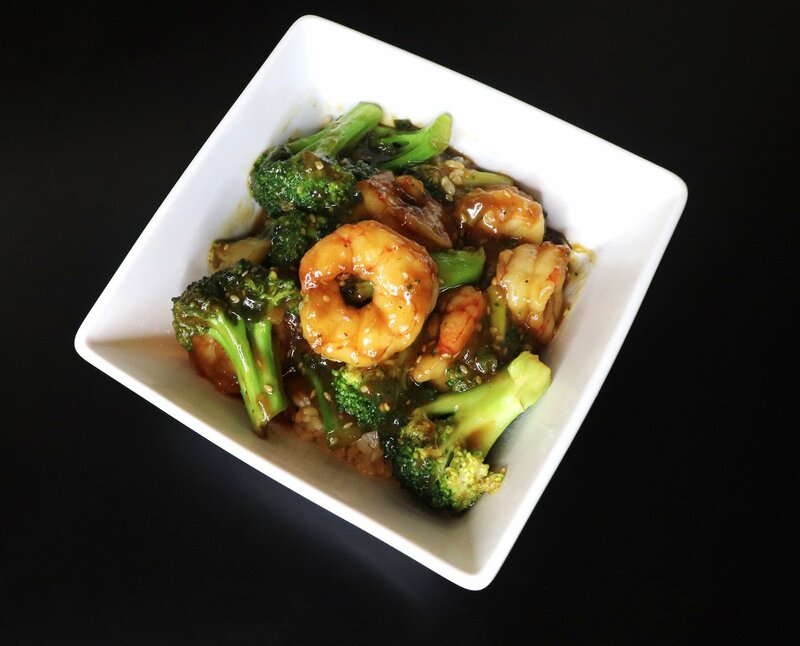 Serve your Shrimp and Broccoli Stir Fry hot, over rice. 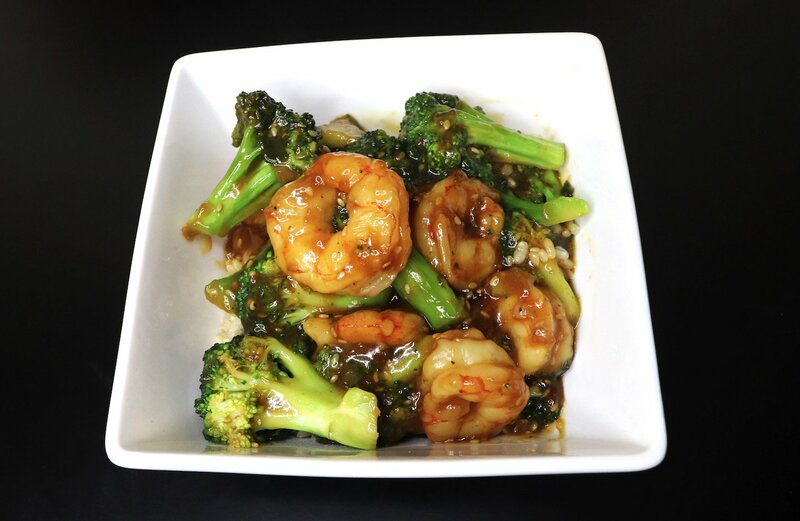 If you enjoyed this Shrimp and Broccoli, then make sure you try some of my other take out inspired dishes like Shrimp Drunken Noodles, Chicken Lo Mein, Shrimp Egg Foo Yung & Crab Rangoon. Thank you for sharing! I’m trying this this weekend. You’re welcome. Let me know how you like it!